I’ve updated the chart with the latest rates and also added the rate for an apartment loan with a fixed rate for 10 years from one of our lenders (details on the loan terms below). The other thing I added was the spread, or difference, between the two rates (on the Right Hand Scale). So far in 2013 the spread has averaged 2.65% or 265 basis points (bp) but it’s not a fixed amount that the lender adds to the T10. You can see that back in the beginning of May when the Treasury rate got as low as 1.66% the spread widened to 280bp because the loan rate was left at 4.5%. 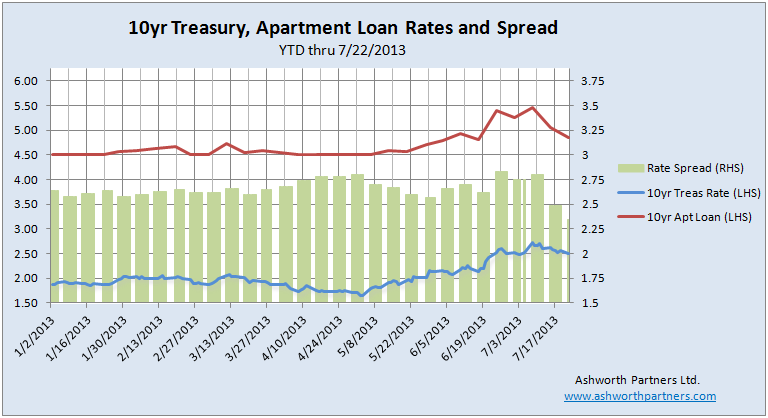 Then the spread narrowed back towards the average even while interest rates went up from there.